Having been trapped in town by various commitments for too many weeks, I have just returned from a couple nights of solo bigfooting. My destination was a location I've been hearing about for many months, along Highway 12 not too far from Morton, WA. Several of my friends and acquaintances have been frequenting this location, and have had some interesting results ranging from strange whistles, rock throwing, and even a daylight visual encounter from a relatively short distance. 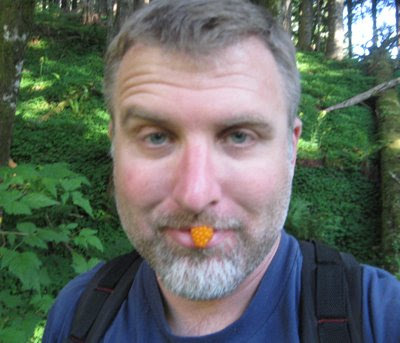 My objective, as usual, was to obtain either audio or video evidence of sasquatches. 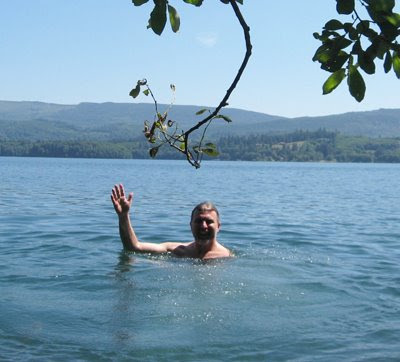 After stimulating the local economy by purchasing my provisions from the community market, I headed to a remote pond near where several sightings have been reported. I like ponds in that they provide the local wildlife with an abundance of food resources. They would also be obvious water supplies, but I suspect that bigfoots would like water that is running and perhaps a little cleaner than these swamps, but I could be wrong. These ponds also provide good muddy substrate for tracking. 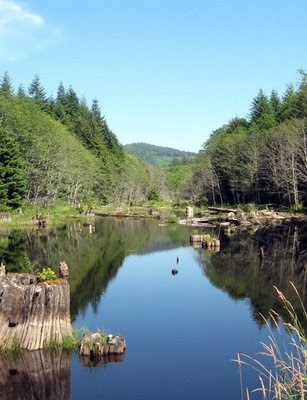 Wetlands, a source of food and shelter. I started looking for a campsite for the night, not too far from the pond. I eventually found one above a nearby clear cut and started setting up camp. This campsite was near the end of a road, nestled in the treeline, with a nearby creek down in a ravine. I placed a game camera in the creek bed along a game trail. To encourage the local wildlife to visit, I cut up several onions and placed a pheromone chip nearby. By placing stinky food items like onions in or near a creek bed, one can be assured that the scent will travel a good distance. During the day, air currents travel uphill as the heated air rises through the ravines, and then later as the air cools, these same air currents switch directions and sweep downwards. At two other locations, I hid game cameras in the brush near road intersections. Large animals often use roads for easy walking, and their predators slink in the brush that parallels these travel ways. I prefer placing game cameras at road intersections, and especially those with nearby creeks, as these are also used as highways by the local wildlife. It is well understood by Native Americans that sasquatches use rivers as travel routes, and I do not doubt their knowledge of the outdoors. A family of deer captured on the road by the clearcut. After returning to camp, I started to prepare the fire by gathering wood and splitting logs. I had several hours before dark, but I didn't want to gather wood without daylight on my side. Shortly after 7 pm, I heard what I thought was a siren coming from the north. The siren rose in pitch, peaked, then dropped in pitch. There was a pause between the siren noises in which it seemed like there was a noise, but it could not be heard well. After three repetitions, it occurred to me that to the north, which was where this noise was coming from, there were no roads, and in fact there was a mountain ridge over a mile away which drops down precipitously another mile or two to the nearest highway. I was not hearing a siren. I managed to catch vocalization number six on the recorder, as well as a few after that, before nearby coyotes chimed in and buried the original siren-call beneath their cacophony of yelps and howls. Another lesson (re)learned... Whether it's "always have a recorder running," or "don't hike through blackberry brambles in flip-flops," it always seems that I learn and relearn things the hard way. The recording is now available on my website, http://www.northamericanbigfoot.com/. The coyotes hung around for the next couple hours, as was evident by their responses to my own vocalizations. I didn't hear the initial siren vocalization again. Of course, soon after dark the wind picked up and I didn't hear much of anything except sticks falling from trees, branches creaking, and the rustle of a million leaves in the dark. The next morning brought another perfect day. It was warm enough by 8 am to wear shorts and my flip-flops, and I went about preparing to be away from camp for most of the day. My goal for that day, based on the 86 degree temperatures from the day before, was to find a way down to nearby Riffe Lake. It took some time and effort, and more than a little blood was shed as I waded through blackberry brambles down treacherous inclines to the cool lake shore (see my previous comment on brambles and flip-flops...). The water temperature was ideal, and I couldn't help but smile as I paddled around without a care in the world. Probably human, but maybe not. "When in doubt, cast it." The cast is currently drying in the sun, still caked with mud, on my front porch, where it will remain for the next few days. Casts do not dry in the 30 minutes the directions indicate is necessary. They may be hard enough to pull from the ground in 30 to 60 minutes (depending on a multitude of factors), but it takes many days for them to "set up" properly. One should not attempt to clean off casts before this waiting period is over, or the cast can be damaged and marked, even by the softest of brushes. As amateur scientists/investigators, we need to take extra precautions against accidentally doctoring or changing the data in any way. A brush stroke might create the impression of dermatoglyphics or skin detail, and if/when this is discovered, it calls into question other data of similar sorts. When I feel the cast has had sufficient time to set up, I'll gently clean it off and examine the details. I'll look at the ball shape, toe sizes, heel width, instep, and other factors. I suspect this cast is from a human source, but the real clincher will be the little toes. Humans, being trapped in shoes for most of our lives, have a little toe that curls underneath the other toes to a large degree. 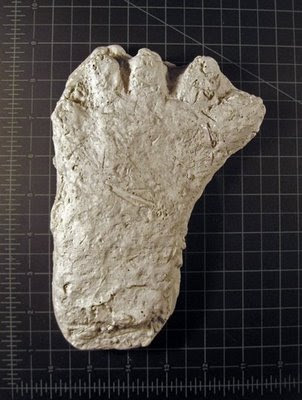 Sasquatches, as well as people who do not habitually wear shoes, have toes that splay outwards, sometimes dramatically, as is shown in the following photograph of a juvenile sasquatch print from my collection. There is a tremendous amount of food for any large omnivore in this area. No only are there yummy fawns helplessly following their mothers around, but nettles, berries, insects, grubs, eggs, birds, amphibians, rodents, and other consumables. I certainly ate my share of blackberries and the more watery salmon berries as I hiked around, replenishing my caloric "gas tank", and hydrating myself with their juices. Salmon berries are the watery, yellowish ones. When I returned to camp, I immediately set up my recording gear (lesson learned?). I still had many hours of light, so I walked to the nearby clear cut to sit and observe things for a while. I found an appropriate stump with a grand vista of the open meadow full of prickly regrowth, and proceeded to... sit. I like sitting. It gives nature a chance to settle down and get used to one's presence. It stills the mind. It's quiet. I continually scanned the treeline, hoping to catch a glimpse of some mammal or other, but everything except birds and plants stayed out of sight. I was particularly struck by the blooming foxgloves. These large, purple and white flowers add amazing splashes of color wherever one's eyes land. They are just another reason to be grateful that I go bigfooting (as if I needed another!). 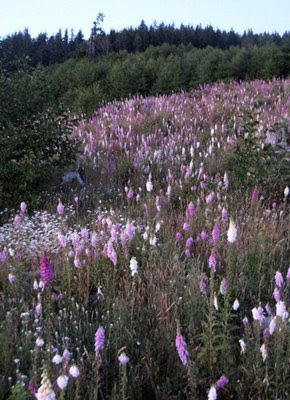 Foxgloves in the fading light. The next night was much like the first in its ferocity of wind and night noises, but there were no siren-howls to be heard. Shortly after 3 am, the coyotes responded to one of my own vocalizations, but from the southeast this time, and only once. I placed uneaten fried chicken on a stump and trained a thermal imager on it all night, but nothing took the "bait". I tried chewing up and spitting out some chicken in the area in order to increase the smelliness of the situation (to increase the odor of something, make it wet and increase the surface area of the item, chewing it up in this case), but apparently nothing smelled it. Then again, I still have over 20 hours of stationary thermal video to watch before I can definitively say that I had no visitors. 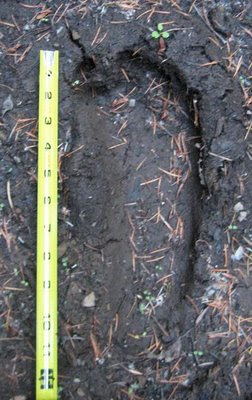 The area along Highway 12 in Washington is an excellent area for bigfooting. There is cover and food everywhere. Huge elk and deer herds wander through the jungles of blackberry brambles where only the foolish dare to tread (in flip-flops). There is a long and rich history of sightings and encounters all along the corridor. I will definitely be back. Over the next week and a half, I will be in the woods for six of the eleven nights, so check back here for updates on my bigfooty life. I'm always up to something 'squatchy! I always wondered why - in so many bigfoot casts - the toes were splayed so dramatically. I've never heard anyone explain it, until now. Thanks Cliff!